New Orleans, LA (April 1, 2019)−Interested in a premier leadership program that fosters connections across the ten-parish region? The New Orleans Regional Leadership Institute (NORLI) will begin accepting applications for its 2019-20 class on April 1, 2019. 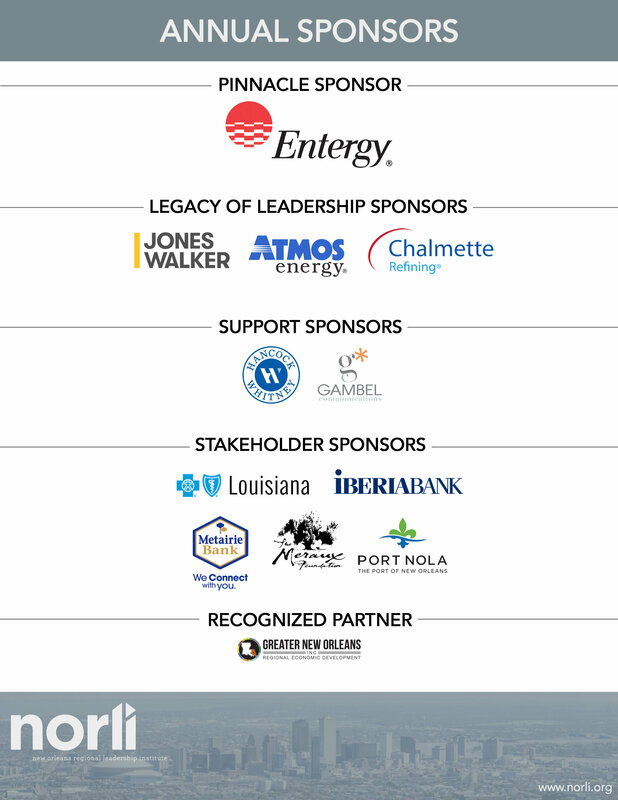 NORLI is open to all business, civic and public-sector leaders in the ten-parish region – Jefferson, Orleans, Plaquemines, St. Bernard, St. Charles, St. James, St. John the Baptist, St. Tammany, Tangipahoa and Washington Parishes. The deadline to apply online is Friday, May 31, 2019. Each year, NORLI brings together a class of over forty-five business, civic, and community leaders representing all races, genders, industries and communities with a mission to promote regional collaboration. The program provides a forum for the exchange of diverse viewpoints and is designed to enhance personal leadership skills by examining issues central to the advancement of the entire ten-parish region. A nine-month program spanning from September to May, NORLI consists of two overnight retreats and seven full-day sessions. The program curriculum examines public policy, education, healthcare, economic development, diversity and equity, criminal justice, and environment, and it dissects how these focus areas impact the development and quality of life of the New Orleans Region. Leaders from across the ten-parish region may submit an online application detailing their employment information and community involvement.A $50 non-refundable application fee is due upon submission of the application. If accepted into the 2020 NORLI class, participants are required to submit a non-refundable tuition fee of $2,750 which covers all program costs and materials, including meals, as well as all the expenses associated with the retreats. Limited support through program scholarships are available on an as needed basis. NORLI will host a series of informational sessions about the program and how to apply. Program alumni and current program participants will be on hand to discuss the benefits of the program and answer applicants’ questions. More details on NORLI events and info sessions can be found by vising our events page at norli.org. All NORLI informational sessions are free and open to the public; space is limited, so advance registration is highly recommended. For more information about NORLI, please visit norli.org or connect with NORLI on Facebook, LinkedIn, Twitter, and Instagram. The New Orleans Regional Leadership Institute (NORLI) is a 501(c)(3) nonprofit organization providing community leaders the opportunity to identify, collaborate, and address key issues for the betterment of the Greater New Orleans Region. NORLI draws upon a diverse group of stakeholders from around the ten parish region to engage in thought-provoking personal and professional development programs covering topics such as public policy, healthcare, education, diversity and equity, environment and sustainability, economic development, and criminal justice. For more information, please visit norli.org.